← What is this “Diseno Porteno” I see on the Ketubah Invoice? Our identity is created from the traditions and customs passed down from our ancestors. We live with the same values and ideals of our parents and grandparents, and pass them on to future generations. People who say that traditions are lost in the modern world could not be further from the truth. Rather, people are more in touch with the words and experiences remembered from history. Because traditions are such an important part of our lives, it only makes sense to go back to them at important moments in our lives; prominently that includes birth, death and marriage. Marriages in Judaism are still conducted with the same words and promises that were made by the first Jewish followers. Traditional ketubahs feature a unique artwork in the style of remnants from historical ketubahs from different eras. Ketubahs found before the Middle Ages featured no artwork, just text. It wasn’t until rich Jewish communities in Islamic countries felt the need to have fancier ketubahs with adornments as they would display their ketuabhs for all the wedding guests to see. The Bucharest Ketubah, above, is inspired by Jews living in Romania in the 16th century. The Romanian Jewish tradition of Ketubah art is one of the best of the European and Ashkenazi Jews. 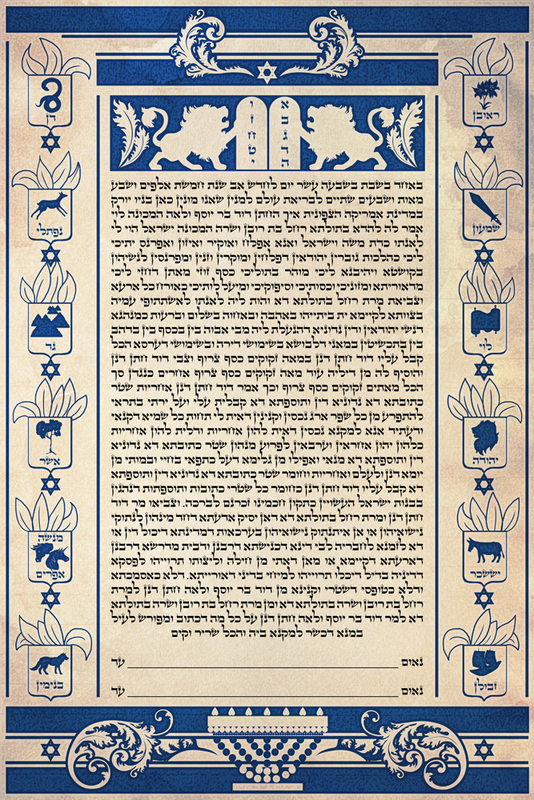 The Ketubot of Bucharest often traditionally included references to the twelve tribes of Israel (such as the names and symbols of the 12 tribes aligning the columns of the Bucharest Ketubah) and the blue that is now so powerfully associated with Judaism. Persian Jews have been known for their tradition of flowery art since ancient times, particularly in Tehran, Isfahan and Shiraz. 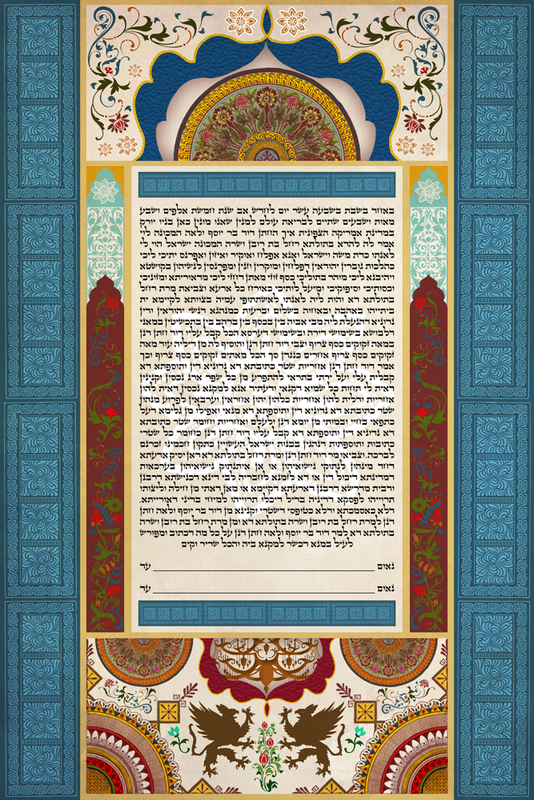 The Tehran Ketubah, above, is a recreation of a traditional Persian Ketubah, and includes the core elements consistently found in Persian Ketubot, including, above all the extreme flourishes and ornamentation.